The Free Gaza Movement, the group behind the Gaza aid flotilla, is a broad coalition of human rights activists and pro-Palestinian groups that has been trying to break Israel's blockade of Gaza since 2008. It is a registered charity based in Cyprus and is endorsed by international figures, including South African Archbishop Desmond Tutu and Nobel Peace Prize laureate Mairead Corrigan Maguire. But in recent years Israeli intelligence agencies say it has grown to include dangerous Islamic organisations with terrorist links. The six-ship flotilla was carrying 10,000 tonnes of medicine, construction materials and education supplies - the movement's largest operation to date. There were more than 650 passengers, among them representatives of the Malaysian-based Perdana Global Peace Organisation, the Greece and Sweden-based Ship to Gaza group, and the large Turkish charity, IHH. 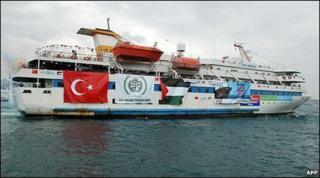 The Mavi Marmara, the lead ship stormed by Israeli troops, was operated by IHH, a group banned by Israel in 2008. IHH raises some of its money from Islamic religious groups and has strong sympathy among Turkey's Islamist-rooted ruling party. IHH, founded in 1992, is now active in 120 countries and has been present in recent disaster areas including Haiti. The Intelligence and Terrorism Information Center (ITIC) - an Israel-based non-governmental organisation which has close ties to the Israeli Defense Forces - does not dispute the organisation's legitimate philanthropic activities. But the ITIC says the Turkish charity is an overt supporter of Hamas - an Islamic militant group that seized power in Gaza in 2007, and is branded by Israel, the EU and US as a "terrorist organisation". The ITIC says it also has evidence the IHH has helped provide weapons and funds for "Islamic terrorist elements in the Middle East". But Greta Berlin, a director of the Free Gaza Movement, said the claim that IHH has links to radical Islamist groups was "utterly scurrilous". She said those on board the Mavi Marmara were unarmed civilians trying to get aid to Gaza. She told the BBC News website that the Israelis acted illegally in international waters and now "they are trying to blacken the reputations of all of us". Israeli Deputy Foreign Minister Daniel Ayalon described the Free Gaza Movement mission as an "outrageous provocation". "The organisers are well-known for their ties with global Jihad, al-Qaeda and Hamas," said Mr Ayalon. "They have a history of arms smuggling and deadly terror." He said weapons were found onboard and used against the soldiers. Israel insists its commandos acted in self-defence, while enforcing a legal blockade of Gaza. The Free Gaza Movement states its mission is "to overcome this brutal siege through civil resistance and non-violent direct action, and establish a permanent sea lane between Gaza and the rest of the world". It attempted to make its first deliveries to Gaza in summer 2008, and tried again in 2009. The earliest aid deliveries were allowed to reach Gaza but later attempts were intercepted. Despite the deadly consequences of its latest aid mission, the Free Gaza Movement says it is already considering sending "a second wave" of boats to Gaza.